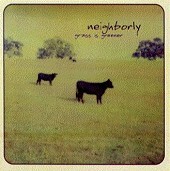 Skiploader's front man, Tom Ackerman, began working on Neighborly after Skiploader broke up in what you could easily describe as a messy one. Four years later? Maybe three, the record is finally seeing the light of day. The same emo-driven pop songs that typified Skiploader run ramped in Neighborly. Ackerman's bittersweet to outright sardonic lyrics rage over jarring indie-rock hooks, giving way to a style of music that could never break into the mainstream without a fluke hit out of left field (hence Skiploader's lack of commercial appeal). However, the ending track, "Spark and Flash," a song about Ackerman's former fan club presidents who died in a car crash coming back from a Weezer show, hints at his ability to write a catchy, solid pop song that is emotional enough to make you want to cry. But, he also manages to keep it catchy enough to warrant you singing along with it, as well as punchy enough to sneak its way into a few hip DJ's play lists, if given the chance. Grass Is Greener proves that Ackerman is more than a drummer (he is currently drumming for Sunday's Best), but also proves he should work on his craft a bit more before trying to tackle the FM format. Though, Neighborly, if they weren't already dead, could have been one of the cult bands that toured and toured and consistently solid 20,000 records and had legions of fans waiting for them at every tour stop. The songs are powerful, you just need to give them a chance. I'll give this a B.